Paraxylene is an isomer of xylene and derivative of benzene and is an aromatic hydrocarbon. Paraxylene is manufactured through a complex process in which catalytic reforming of naphtha to BTX, is carried out in the first stage. Fractional crystallization of xylene then leads to the formation of paraxylene. Globally, development of textile industry around the globe, rise in the demand of Polyethylene Terephthalate (PET) bottles due to growing packaging industry, and increasing requirement of polyester fibre are the prime growth drivers of paraxylene market. In addition, increase in adoption of paraxylene for newer applications, and emerging economies such as China, India and others, will create new opportunities for paraxylene market. However, higher cost of production and complex manufacturing process, stringent government regulations, and volatile prices and supply of crude oil are the key restraints for paraxylene market. This report identifies the global paraxylene market size in for the year 2014-2016, and forecast of the same for year 2021. 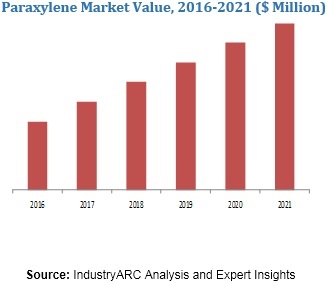 It also highlights the potential growth opportunities in the coming years, while also reviewing the market drivers, restraints, growth indicators, challenges, market dynamics, competitive landscape, and other key aspects with respect to paraxylene market. Geographically, Asia Pacific dominated the paraxylene market, and is projected to have fastest growth, owing to rapidly increasing population, rise in polyester demand in textile and packaging, and growth in the chemical industry in developing nations such as China, and India in this region. Among all the end-users, Purified Terephthalic Acid (PTA) segment has the highest market share in paraxylene market.